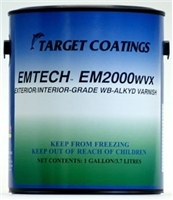 Target Coatings Emtech 2000® WB-Alkyd Varnish (EM2000) represents the latest formulary technology in water-based wood coatings for fine woodworking, architectural and yacht finishing applications. 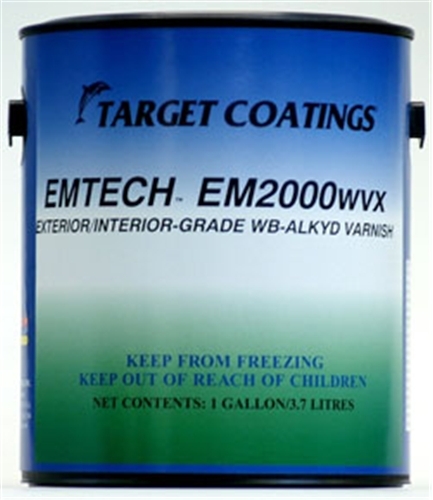 Emtech 2000 Varnish will create and define the warm glow of a traditional alkyd based varnish with the speed and safety of modern water-based systems. While designed for spray applications, EM2000 is specially formulated to excel in brush-applied and wipe-on applications as well, all with exceptional results. For ease of use in brush or spray applications on natural or stained wood with excellent durability and chemical resistance, we highly recommend Emtech 2000. A premium finish for high-end applications and ease of use.